Wash & peel the Asparagus; wash and halve the Tomatoes. Drain and slice or halve the Olives. 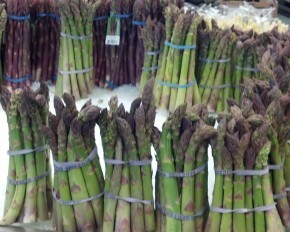 Place the Asparagus in a shallow baking dish; sprinkle with Salt & Pepper. Scatter the Tomatoes, Olives and Basil over the Asparagus. Sprinkle Olive Oil over all. Bake for 15 minutes in a preheated 350 oven.